They call it the city that never sleeps for a reason – New Yorkers can’t, not with that immutable racket banging a collective tattoo on the eardrums of the Apple’s yawning hordes. New York’s Open Data noise complaint spreadsheet makes for interesting downloading and reading, but try to grab a quiet seat in the library first before you give it a look. You can get it here (the workbook, not the seat), after clicking the laconically-named Noise link (listing 116, the one captioned NYC Noise complaints for 2012). Download it as a CSV (perhaps the speedier mode), but save it as a duly certified Excel workbook; and sized at 62MB, make sure that seat is well padded during your wait, while your hard drive reels from the impact. Interesting, not a little amusing, but yet occasionally reproachable, the data indeed require a look, and a well-considered one. For example – given their peculiar informational relation to time sensitivity, complaint records would serve investigators smashingly with date and time stamps, and the Created Date field in B comprises the former only; and while the Due Date field entries are in fact properly time-laden, the meaning of a due date is unclear (to me at least), and incomplete besides. And don’t confuse the City and Borough fields, the latter strictly admitting just the names of New York’s five counties (boroughs). The City field, however, granularizes its Queens references, drilling only these down to their neighbourhood names (a common New York postal practice, by the way) and hence subverting any inter-borough comparability. Moreover, columns AA through AW don’t seem to belong here, having either been abandoned, headed by extraneous field names, and/or stocked with the Unspecified code. As such I’d delete the whole lot, and show the door as well to that very last Location field, which textualizes latitude and longitude information that’s already there, and in far more usable form in the immediately preceding columns. Overall byte saving as a result: about 18MB. And I don’t suppose you need reminding about the ubiquitous column autofit. 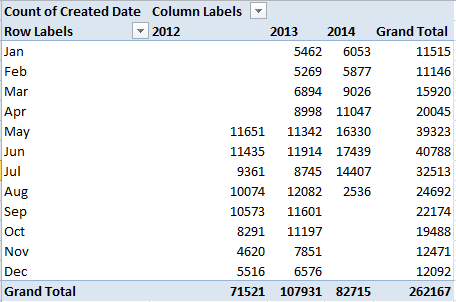 Row Labels: Created Date (grouped both by Months and Years, that latter qualification a probe for misfit records dated a year other than 2012). In other words, we’ve been fooled, kind of. The data in fact begin in May 2012, but roll on nevertheless all the way to this very week. And that’s fine with me, but let’s just understand the time span we’re really dealing with. We see that this year’s May, June, and July complaint numbers push well ahead of their prior monthly counterparts (and August looks to be similarly paced), setting off the usual methodological caution: is the upsurge a creature of a sharpened acuity in New York’s recording tools and/or a heightened litigiousness among New Yorkers, or a “real” pumping up of the volume by New York’s noisemakers? With 43% of all the complaints, the early-morning proportions don’t seem to incriminate Manhattan. But on the other hand, would anyone want to allow that Manhattan’s 3 AM population stands at 3.6 million?